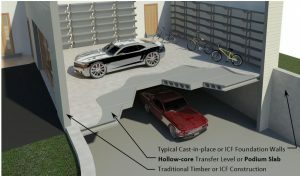 In single family residential structures, a typical garage floor can be converted to a Hollow-core floor to increase the living space below. In most cases, the Hollow-core floor is able to clear span from foundation wall to foundation wall allowing interior columns or bearing walls in the basement to be removed. 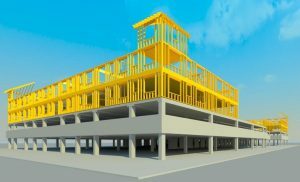 This Hollow-core level can act as a Podium Slab, where loading from the wood frame construction above can be transferred directly into the foundation walls. These slabs offer high fire ratings, reduced sound transmission, as well as reduced vibrations between living areas. In addition, the ceiling surface is flat and paint ready.